Morocco’s newest museum opens next month in Rabat, and will soon after host the “Medieval Morocco” exhibit via Paris’ Louvre. Morocco is due to get its first major national museum since gaining independence from France more than 50 years ago. 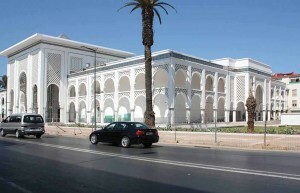 The Mohammed VI Musée National d’Art Moderne et Contemporaine will open officially on 25 September. Located in the heart of the capital city Rabat, the three-level 22,350 sq. m building will consist of 4,921 sq. m for a permanent collection and 2,558 sq. m for temporary exhibits, conservation laboratories, an auditorium, education center, a multimedia library and a café. The ministry of culture and the Fonds Hassan II for Economic and Social Development funded the 73m Dh ($9m) building and Abdelazzi Idrissi, an archaeologist and conservator, has been appointed its director. The museum was scheduled to open at the end of May, although many thought the date somewhat optimistic.